The purpose of Sensorial work is for the child to acquire clear, conscious, information and to be able to then make classifications in his environment. 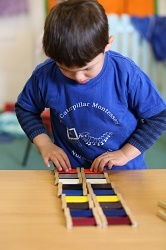 Montessori believed that sensorial experiences began at birth. Through his senses, the child studies his environment. Through work with the sensorial materials, the child is given the keys to classifying the things around him, which leads to the child making his own experiences in his environment. Many of the exercises in this area are also indirect preparations for later mathematics and language work as they enable the child to order, classify, seriate and describe sensory impressions in relation to length, width, temperature, mass and colour.